As wind and solar power gain increasing market uptake, the variable nature of their electricity production is creating a pressing need for cost-effective energy storage. Further, large-scale energy storage may allow utilities to defer upgrades to transmission and distribution infrastructure while better managing the highly dynamic electric grid at the second-by-second (frequency regulation) and hour-by-hour (peak shifting) time scales. However, most of today’s grid-scale energy storage technologies face technical, economic, and regulatory constraints that currently limit their acceptance in the electricity industry. To address this challenge, the U.S. Department of Energy (DOE) and The Minerals, Metals & Materials Society (TMS) turned to Nexight Group for our expertise in collaborative planning. On July 19-22, 2010, Nexight Group led back-to-back expert workshops to chart a course to ubiquitous grid-scale energy storage. 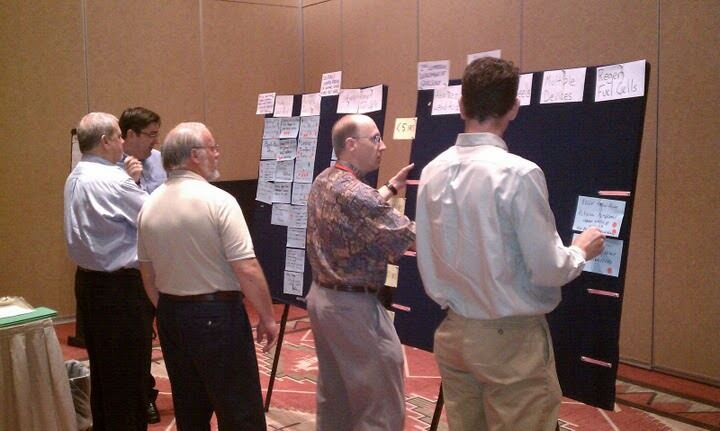 Working with Sandia National Laboratories and TMS, Nexight Group facilitated two workshops to identify energy storage needs and solutions for utility applications. The workshops were jointly sponsored by the DOE’s Office of Electricity Delivery and Energy Reliability, the Office of Energy Efficiency and Renewable Energy’s Solar Energy Technologies Program, and the Advanced Research Projects Agency-Energy (ARPA-E). Nexight Group Executive Vice President, Ross Brindle, led the facilitation team. The Utility and Industry Needs for Grid-Scale Energy Storage Workshop brought together 40 representatives of utilities, vendors, and technical experts to identify energy storage performance targets for distinct utility applications such as load following, time shifting, area and frequency regulation, and renewable capacity firming. The Advanced Materials and Devices for Stationary Electrical Energy Storage Workshop brought together technology developers, researchers, and utility experts to identify advanced material solutions for storage devices to meet performance targets. Devices include advanced lead-carbon batteries, sodium batteries, lithium-ion batteries, flywheels, capacitors, flow batteries, and advanced technologies. Nexight Group is working closely with TMS, Sandia National Laboratories, and the project sponsors to analyze the workshop findings and to prepare a national strategy for developing and deploying grid-scale energy storage. For more information about this project, please contact Ross Brindle at 240.667.7636.